I’ve been needing a new home office chair. My current one, a <$200 leather chair from either Staples or Office Depot, is usually comfortable, but the “memory foam” seat lost its support and springiness, the seat reclines with the back, and the armrests are too high and not adjustable. Long sessions at the computer leave me stiff and achy. After flip-flopping between buying an ergonomic task chair and buying a standing or sit-stand desk, I decided to upgrade my chair. 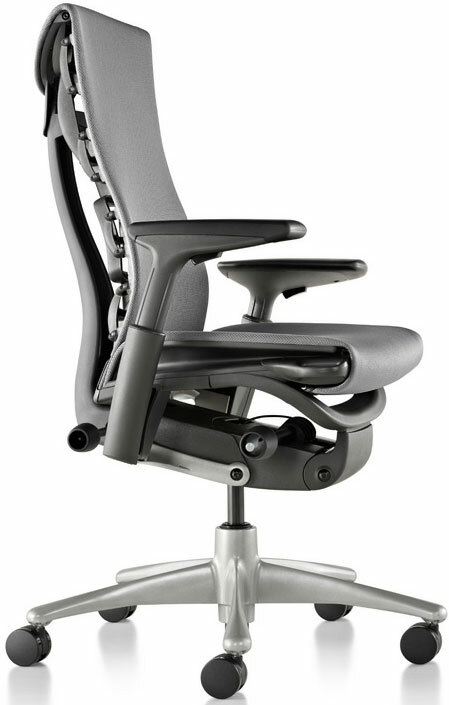 Herman Miller’s Aeron chair is said to be the best in the business. But it comes in different sizes and my body type puts me in the gray medium/large area. Looking at reviews online, it seems that some love it, some hate it, and that it can be a pain to configure with the right lumbar support options. Its price is a bit steep – over $700 via Amazon – and I wasn’t too keen on playing around with sizing options. A little more research and I found out about the Embody chair, which is said to be a successor to the venerable Aeron. Reviewer after reviewer report that the Embody is the most comfortable chair they’ve ever sat in. With a $1000+ price tag it had better be the most comfortable chair ever. I spent a bit more time looking online for chair recommendations and reviews. In the end, it seems that the Embody was very well recommended. A few user reviews on Amazon mention back pain, pinched nerves, and other issues, but there were so many more good reviews that I decided to take the plunge. The Embody would be the last computer chair I ever buy, or so I had hoped. There are no Herman Miller showrooms near me, and I wasn’t too keen on paying shipping fees, restocking fees, and penalties, so I ordered from Amazon. The only model available for Prime/Super Saver shipping is a plain-looking all-black chair with the premium cushiony fabric. I would really have preferred a bit of color, maybe one of the shades of blue, but not at the risk of several hundred dollars should I need to return the chair. I was under the impression that the chair is ready-to-sit straight out of the box. However, I received a knock-down model, presumably to make it more suitable for UPS shipping. I hit a few snags with the assembly, but nothing a bit of foul language couldn’t fix. The instructions are well-written, with tips such as “there should now be a gap of credit card thickness between the back and the seat,” and proper bolt toque values. The chair features a ton of adjustments – reclining tension, reclining stops (4 settings if I recall correctly), seat depth – you can lengthen or shorten the seat for thigh support, seat height, armrest height and width, and backfit – to adjust for upper-back curvature. Here’s a PDF with more info. Some think the chair looks space-age, others thinks it looks out of place. I loved how unimposing it looks with the narrow back. To me the chair just blended into the background as a piece of office furniture should. As expected, the chair feels like a $1200 chair should. Adjustments are controlled with ease, the materials feel like a thousand bucks, and every aspect is absolutely perfect. Well, near perfect. One of the suspension fastening points was not quite seated, but a quick squeeze locked in the little plastic rivet. If I left it as-is nothing bad would have happened. The seat is build from an array of independent suspension points, which moves and shifts with your body. The back of the seat is designed to do the same – it flexes and adjusts as you wiggle around and even stretch. It’s supposed to promote micro-movements, which are said – not just by Herman Miller – to be great for circulation and lower stress on your body. Sitting in the chair was a pleasure… until my lower back started to ache. Maybe I’ve been hunched over in my old chair so much that it distorted my back. Maybe I have an abnormally shaped spine. Maybe I was just adjusting things wrong. I spent a few hours in the chair Saturday morning. Everything was fine and peachy, and I remarked to my wife that the chair blends away out of my consciousness. It’s there, but I don’t feel it. But then my lower back started to ache. I adjusted the chair again and again, but couldn’t get comfortable. After fidgeting for an hour or so, we went to the mall. My lower back ached, but walking around made me feel better. By the time we got home, the back ache went away. I sat in the chair, tweaked the adjustments, and did some very important work. Actually, I played a game – which is a great way to test out the abilities of a chair. Again – the chair was comfortable for a bit, but then my back began to ache. It’s hard to describe, but it felt more like fatigue than an ache. No matter if I’m describing it correctly or not, I was uncomfortable. I headed off to the couch with my wife for some relaxing TV time and then went to bed. Sunday morning I felt fresh and ache-free. I sat in the chair at 9am. I got up at 9:30 to retrieve a snack and then sat back down. 10:15 or so I got up again for a moment and sat back down. 11:30am my back was aching again. Almost needless to say, the chair’s already packed up and will be dropped off at UPS for return to Amazon. I really wanted to like the chair, but it just didn’t work out. Right now I’m typing this hunched over in my old chair – possibly damaging my posture in the process – but I’m much more comfortable. I have owned 4 office/task chairs in the past 15 years or so. In addition to those chairs, I’ve got another task chair at the lab and have spent a bit of time in my parents’ computer chair. Those 6 chairs combined cost less than the Herman Miller Embody chair, and none of them gave me aches the first day I sat in them. Maybe the chair is defective, or maybe it’s just not working properly. All I know is that for over a grand it should have been the most comfortable chair I’ve ever sat in. And it wasn’t. How can I expect a super-premium office chair to last me 10+ years if it hurts me on day 1? The build quality, materials, and ease of adjustment are definitely worth recommending. But in the end the chair was just not a good match for me. If you’re interested in buying an Embody chair, make sure you can return it without too many fees. Even 30-minutes at a showroom might not be enough as my discomfort only developed after a continuous hour or so in the chair. I have the exact same issue as you did, sadly. Lower back becomes uncomfortable, and I need a chair I can use ache-free for 80 hours a week or so 🙁 My back should be fine, I mean, I’m not weirdly built. 6’1, 165 pounds. I’ve been borrowing someone’s office chair – a Steelcase (Leap I think) – and it’s awesome. Don’t know how to use all these settings just yet – but no backaches. And just because – http://9gag.com/gag/4658623. I’ve had an Embody for a couple years, and I’ve had a lot of discomfort and back problems ever since I got it. With so many positive reviews, I figured I must have something else wrong, and it couldn’t be the chair’s fault…but now I’m starting to wonder. I checked the Amazon reviews and it looks like we’re not the only ones. What other chair did you end up buying instead? It’s going to be a pain trying to sell this sucker, but I think I might have to replace it with something else. I ended up with a tall chair from Ikea. It’s not the most features and not at all adjustable, but is comfortable enough until I find something better. Before that, but after I tried the Embody, I tried a tall industrial chair and standing-height work surface. That was okay, but I ended up sitting down more than standing, so I lowered the desk and went with the Ikea chair.